Ever ‘resolved’ to start eating healthy only to have the wheels fall off after a short time? By making healthy habits a part of your everyday life you can essentially ‘automate’ daily decisions. And avoid the need for willpower. This way, eating healthy isn’t something you battle with every meal. It’s on autopilot so healthy choices become effortless. Even enjoyable. What sort of habits are we talking about? For me, my weekly shopping habit is the foundation because without it I wouldn’t have lots of veggies in the house. And you can’t eat something that isn’t there. Cooking for my family on a daily basis is another key. As are getting 8 hours sleep and making sure I eat my meals sitting at the table (no snacking on the go). It’s different for every person of course. We don’t all need to follow the exact same habits. The secret is working enough healthy habits into your life so your ‘autopilot’ is steering you in a healthy direction most of the time. That way you can not only indulge in that Friday night pizza or Sunday afternoon ice cream, you can enjoy it completely guilt-free. And without any ill effects. 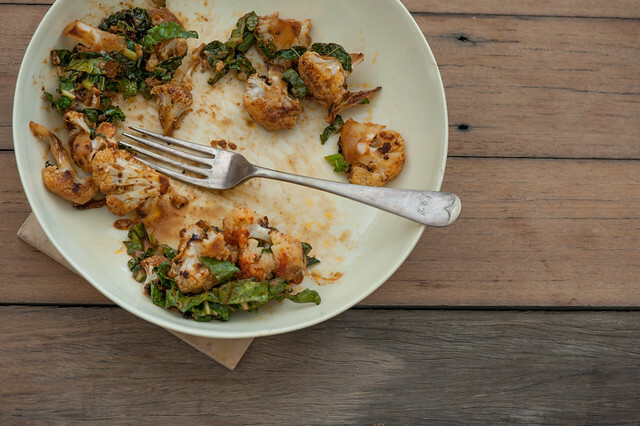 Like to put your healthy eating habits on ‘autopilot’? 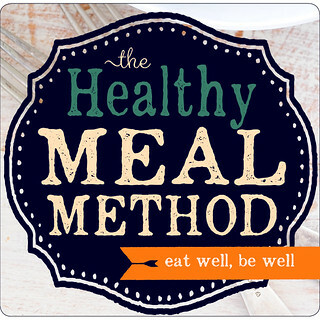 Then join me for the 2017 edition of my online cooking program, ‘The Healthy Meal Method’ – an online training program that teaches simple, healthy cooking habits. I can’t remember where I got the inspiration to combine Japanese miso paste with Moroccan harissa. But I’m so so glad I did. Talk about a flavour bomb. To be honest I love roast cauliflower on its own, but with this dressing it is seriously one of my favourite things to eat. Ever. And I take these things seriously. Very seriously. You definitely need to make this one! 1. Preheat your oven to 250C (480F). 2. Combine miso, harissa and olive oil in a small bowl. 3. Place cauli in a roasting pan. Toss half the miso-harissa dressing over the cauliflower. Roast for 15-20 minutes or until cauli is cooked through and browned around the edges. 4. Meanwhile, add the vinegar to the remaining dressing. Taste and season, adding more miso, harissa, vinegar or just some salt if needed. Although it’s probably delicious just as it is. 5. 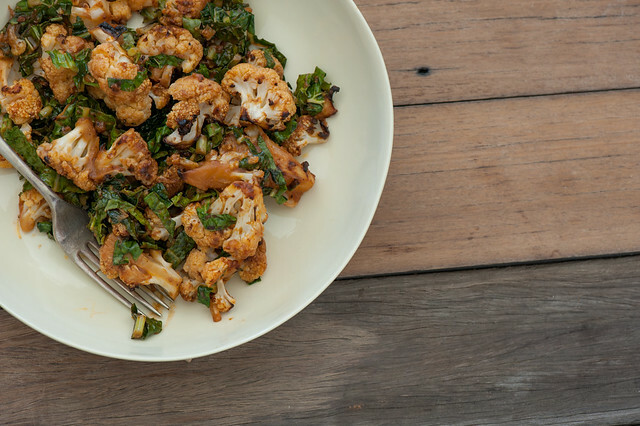 When the cauli is cooked, toss in the kale and extra dressing and serve warm or at room temp. different veg – also lovely with broccoli instead of the cauli. I can imagine the dressing would also be brilliant with roast sweet potato, butternut squash, zucchini or even roast spuds. If you’re not into kale, try a bunch of flat leaf parsley or a handful of baby spinach leaves to add the leafiness. more substantial / carb lovers – toss in some cooked couscous, quinoa or brown rice. Or serve with warm flat bread. complete meal – serve with grilled or pan fried chicken or fish. Or crumble over some feta or your favourite goats cheese. A handful of roast nuts (I’m thinking almonds, pine nuts or macadamias) would add excellent crunch and some more substance. A few poached or fried eggs wouldn’t go astray either. And one day I’m going to try it with cooked lentils and on another day with cooked chickpeas. no miso – my supermarket stock white miso (shiro) in the Japanese section, but if you don’t have any, just use 2 tablespoons soy sauce instead. no harissa – OMG you really should try and get some. It’s a Moroccan chilli and spice paste that adds incredible flavour. But substitute any chilli paste or chilli sauce or even some chopped fresh red chillies. Just add a little at first if you aren’t sure of the heat intensity. ps. Not sure if changing your habits could help you? Nancy, Healthy Meal Method Student. Julia, Healthy Meal Method Student. I’d really love you to join us for this years program! LOL at your comment on Harissa. I found some at the store – Mina brand – and have it on my eggs each morning. Love! Interesting because this is the second time in a couple of weeks where I saw the miso+ harissa combo! I’ve never had harissa. I made the recipe that I saw, but I just looked up the ingredients in harissa and sort of winged it. Habits are so so important. Mine are similar to yours. – I try to not keep unhealthy food in the house. – When I pack my lunch and snacks for work, it’s almost completely fruit and veg. – Pretty much eat salad for lunch every day. Harissa is the best Marcia! YUM! I loveeee cauliflower! And thank you for the advice! I must admit, you have a very tidy blog here and a cool comments section. The roast cauli looks yum yum too. Am gonna try some of that. Thank you for bringing this to my attention.